You're going out of your mind! The sales team is not delivering things on time. No one knows who is the final responsible. The slow decision making process is killing you. You keep talking to people about the way things are ought to be but you still have the same hassle in production lines. As this goes on, the struggle of meeting your business goals keeps shocking your ambition of building a successful company. And this is what bad organizational structure can do to your business. It stresses you out and puts loads on your mind. Because an organizational structure describes how a company, a division, or a team is built. So it's like a map that organizes all people's relations, clarifies who reports to whom and who is responsible for what. That's why when you put the wrong people, at the wrong place at the wrong time, you move with your organization to the end of the cliff faster. Organizations either overlook the importance of organizational design or simply don’t know what to do. For instance, if roles are not divided properly, unworkable roles - that are too specific or over divided - will arise causing inefficiency and delays in the decision making process, also, it could make organizations unable of effectively responding to market changes. The fact that organizational structure is viewed as a complex thing that can't be done without deep business knowledge, made it even discouraging for new businesses to adopt the concept. While in the modern work environment, a business is no longer a place for work, it's an entire community where individuals share their own visions and innovative new ideas. So organizational structure is no longer about the channels of communication or the written charts, it's more into everyday relationships between people inside the organization. When planning for your organizational structure, you need to keep your business goals in mind, because even if you hire good people without a clear structure in place, you will be wasting your time and resources. That's why when big companies change their strategies, they look again for modifications and do internal changes to the way they recruit to make sure that different functions are not working against each other. The first organization structure aroused when there was a need for more efficiency and effectiveness, when companies wanted to remain the same and maintain their position in the market, during these days, whatever structure needed was put in place and people adapted to it whether they liked it or not. This was until 1930's when the human factor aroused to give bigger recognition to the needs and opinions of employees. Just like wolf packs, red organizations are led by only one strong person who controls with power and commands others on what to do. There wasn’t much about red organization as they were made they were the simplest and first form of organizations the world ever saw. But in today’s world, this form of leadership doesn’t exist in organizations that much rather in gangs and mafias. Usually, there are no formal hierarchy or seniority levels which makes it hard for this type of organizations to scale. Red organizations will usually fail the test of the modern world when it comes to strategy and planning, however, they enjoy a highly reactive ability in unstable environments. 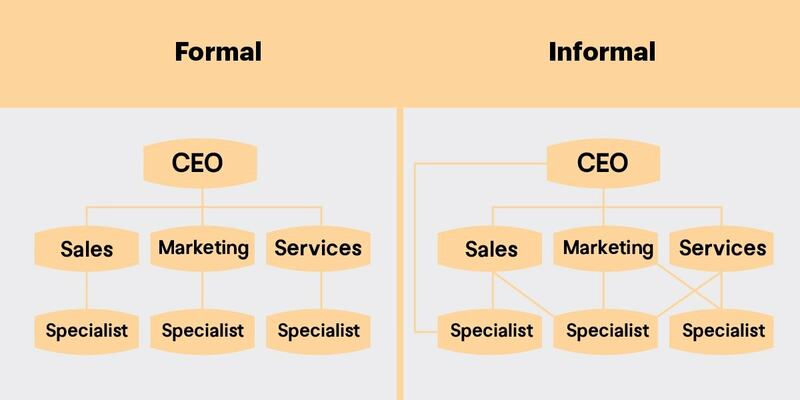 During this stage, organizations started to get closer to the form that the world knows toady, where there are structures, reporting lines and job titles, and as a result for this hierarchy structure, the decision making process flew from top to bottom with no way back or middle management communication. This somehow created a social difference between talents inside factories, starting with different uniforms to different treatments and launch areas, this caused the forming of intolerance groups that act against each other. A good metaphor for this type of organizations is the army, where there are soldiers following the orders and commanders controlling the decision making process with no room for innovation. Leaving this type of organizations is not just a betrayal, but also employees will be snatched from their communities. And although amber organizations might seem a little like red organizations, they are totally different at heart. While red organizations only think for the short term, amber organizations can take down long term projects like building the Great Wall of China or the pyramids. These great accomplishments were done during the amber consciousness era due to having solid processes by this time. Through these processes, organizations were able to repeat the same process with much more efficiency. With the rise of processes, there were also middle management levels, so information flew from the top level management to the department managers then production line workers. This means that planning remained an exclusive duty for the top management while execution was only for lower levels. This form of command and control leadership was adopted due to the prevailing worldview back then that workers are dishonest men and thieves who should be under supervision. We could call it the era of innovation, where project groups and cross functional initiatives appeared to the surface. Moving into orange organization was a leap when it comes to how innovation is promoted inside organizations, instead of discouragement, organizations started encouraging innovation and allowing it to beat up its competition. New departments, job titles and rules were created to support the new orange organizations pursuit as they moved from command and control to predict and control techniques. Also, the essential functions like finance, risk management and IT got centralized in the headquarters. Today’s organizations are most likely inspired by the orange model, they retain a hierarchical shape while incubating R&D department in order to utilize all the talents it has inside, they give them the absolute freedom to come up with new solutions. Under orange organizations, talent management initiatives like performance appraisals, bonus schemes and awarding systems were developed to support the innovation environment that companies were trying to make. Green organizations adopt a servant leader concept, where top and middle managers are sharing power with their subordinates and giving them the support and motivation needed to go through problems instead of working as problem-solvers themselves, this sometimes is referred to as the "inverted pyramid". As clarified, the theory divides power equally between individuals so everyone has the same share to make decisions, so front line employees are empowered to make decisions without management approval as they are directly working on day-to-day problems which makes them more aware than distant experts. In green organizations, managers are rated fairly according to morale surveys and 360-degree feedbacks, huge amounts of money are invested in training new generations of leaders and even in some cases, teams choose their leaders not vice versa. In green, employees are part of a family, they have responsibilities and rights and ready to have each other's back in good and bad times. And what keeps green organizations running as a family is the culture it tries to build within its individuals, so they can make decisions and behave on behalf of the organization internally or externally following shared values not policies and rules. So while orange organizations have strategy as the main driver, green organizations are culture-driven, they believe in higher purposes. Social responsibility towards the community is just an integral part of their system not and additional requirement from the government. You can find them taking decisions based on the community's best interest not just bringing more money for investors. Many initiatives are run under green that improve suppliers working conditions and employees well-being in addition to the environment and the whole community. Accepting the fact that it will be abused by people who are still living in the Amber and Red consciousness era. Know that not all the people will share the same tolerance worldviews and set limitations. Also the family concept causes issues of looking for sameness to join that family, so instead of valuing people based on motivation and capability, they look for people who will behave just like them which makes choices limited and drops diversity levels. Finally, green needs to understand that by removing all the formal structures and hierarchy, they are not eradicating inequality. Informal structures will take place and this will reduce transparency and lead to much bigger disasters like having internal silos. The final form that organizations have evolved to is the teal, where organizations are considered as complex adaptive systems that are decentralized and consist of self-managing teams. Inside these organizations, power and leadership are not static, they are transferred to those who earn it the most based on passion, interest or expertise. What makes this paradigm unique, is encouraging employees to show up as who they are as humans with all the flaws and emotional sides of their personalities, rather than pretending perfectionism, teal organizations developed a set of practices that revolve around bringing your whole self to work. This system is supported by conversations that clarifies the organization purposes to everyone involved to make sure they are all aware of the big picture, so while orange organizations are like machines and green ones adopts a family concept, teal are like a living organism. Through this evolution, many organizational structure models appeared and evolved, over ranging from complete bureaucracy to the self-managed organizations, however the basic elements of any organizational structure remained the same over time. The number of team members a leader can manage effectively and as this number gets bigger, the span of control gets wider. 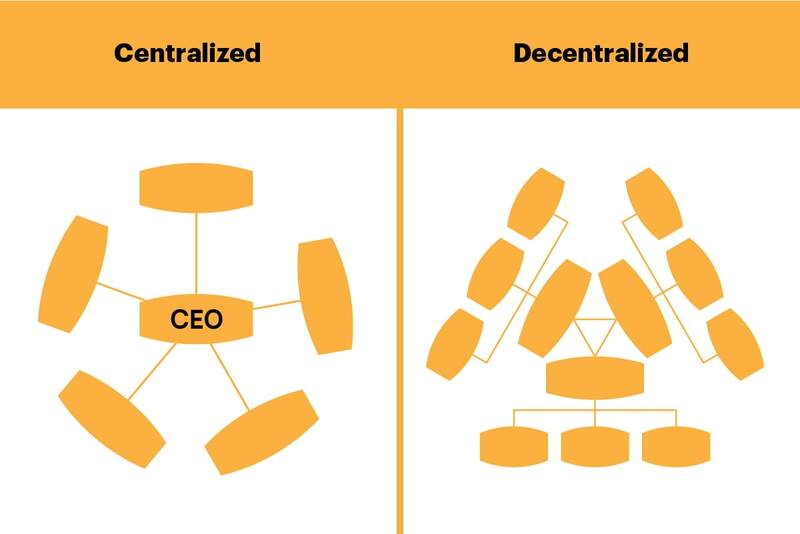 The extent to which the decision making process is centralized, for example, in highly centralized companies the decisions are mainly taken by the CEO or the executive board, while in flat organizations, the power of authority is distributed among all the team members. The extent to which the members of the organization have depth knowledge in their fields, high degrees of specialization makes employees able to detect problems easier and gives them a high level of experience and increases their productivity, on the other hand, low degree of specialization allows for more flexibility as employees can shuffle between variety of tasks without struggling of learning about the new task since they already have a background about it. Formalization is the degree to which the organization is going to have roles and tasks clearly defined and described with all the relationships, skills and all the job requirements. In organizations that are less formal, you can find the role adhering to the person filling it and they have the opportunity to innovate and set structure, teams and processes that they see best fit for the role. The way in which the organization is divided into teams of certain functions and how these teams are communicated. ‘The more the teams are rigid, the less the communication between the teams is established’. And in today's work environment, this type of rigid structure is not encouraged. During this time, innovation was not encouraged across all levels of the organization, it was only the duty of the high level management, while other employees were only responsible for getting things done. Under a hierarchical structure, C level management took most of the decisions inside the organization and have the authority over information flows, however, this type of models is so outdated, it makes employees inside feel like machines who are responsible only for executing orders and the truth is, nobody ever asked for bureaucracy. This was effective in the past, when no one cared about the kind of experience they're having or paid attention to their learning curve, but in today's technology world, this model can draw back the organization and make it less competitive because employees inside are not experienced enough to handle major shifts in what they do and almost trained not to think. You might need a little structure with a sense of humanity inside your organization, this is why the semi structural era was brought to us. The models created during this period will be most convenient for your business if you're looking for something to maintain everything organized with a little autonomy, it all depends on your business objectives. 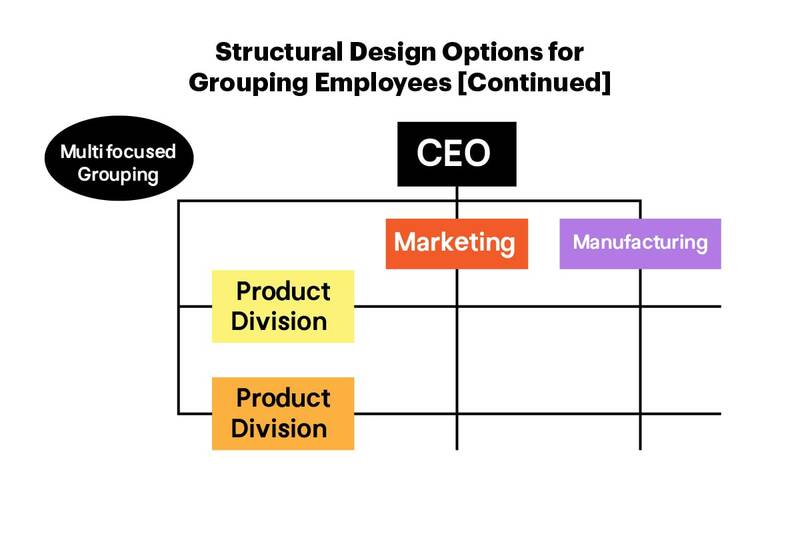 Functional structure has a bit of hierarchy but is still common between modern companies. 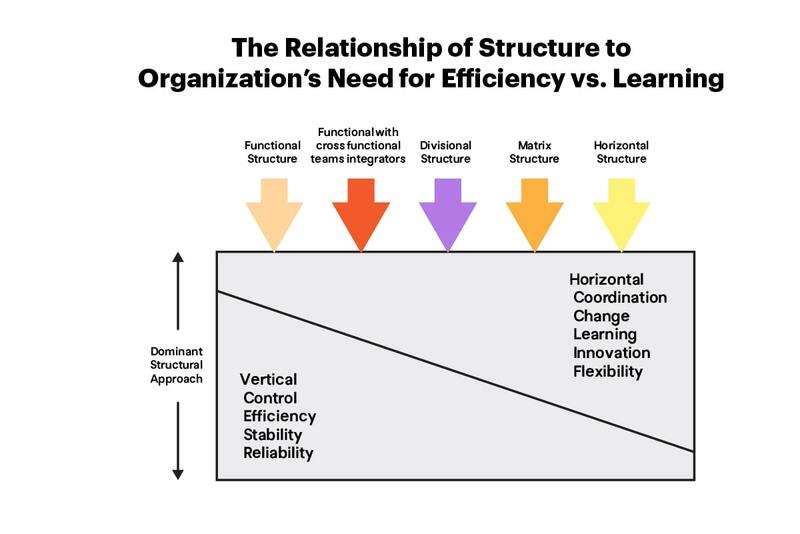 When you need your business to be aligned around what teams do and everyday activities, you need to consider a functional structure depending on your organization activities. So you divide up your company into teams like: marketing, sales, product management. You can add up all the teams you need for a solid infrastructure as long as they are divided by the job tasks needed to perform. The communication between these teams can be aligned through different communication channels like software or team heads meetings/stand ups. This structure provides a high degree of specialization as every team is focused on getting things done and easily scaled. If you choose to go with functional structure, remember that it might be a little silos creator as teams might not be aware of each other jobs as long as they don't intersect. However, this problem can be beaten easily through bridging the communication gaps with various team activities and meetups. Let's assume that you are the owner of a company that makes three different types of chocolate. One for kids, one for people on diet and one for women. At this case, you will definitely need a different marketing and production strategy for each. When faced with this situation, companies tend to assign a marketing team for each product, aka division, so they can have laser focus on every market and case individually. 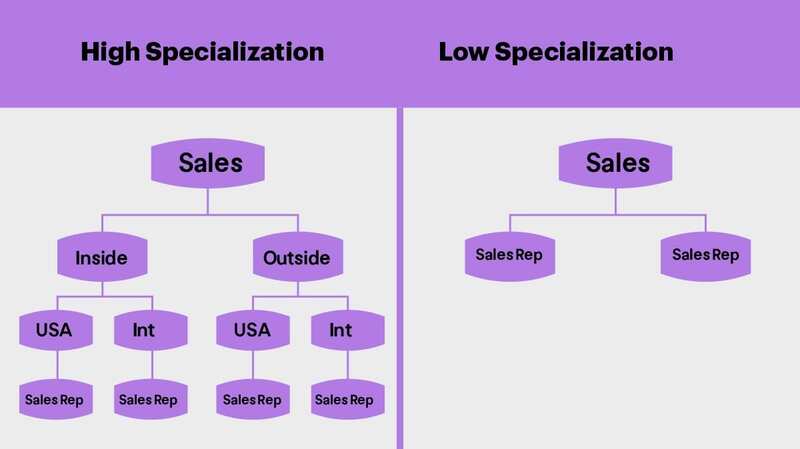 The side effects of going divisional, is that when growing your organizational structure, the company might end up with multi-layer divisions so you will have something like an inflation in your structure. If you're running a company that has branches all over the world, you might need to understand each territory on its own and get a closer look into each of your different customers' needs, or you might need to be near your suppliers and buyers. In both cases, it’s always beneficial to have a dedicated team especially if they are local citizens who are familiar with the market needs and traditions. When you want to give it all to the project management to handle, Matrix is a very good choice. By dividing your organization into two intersecting lines that form cross functional project teams. Inside this structure, each team member will have two reporting lines. One to his own main team and the other to the project manager he is working with. But it also depends on what level you want to keep your project management control, for instance, you can have from weak to strong management. A project manager is only playing a supervisory role where he rarely interacts with the team leaving the handling for functional managers. The power is shared equally between the project manager and the team leader. A project manager is primarily responsible for the project, functional managers provide technical expertise and assign resources as needed. The matrix system proved its efficiency for many companies in removing silos and barriers between team. Also, it helped raising the specialization level and spreading information across the company but you need to watch out of creating something that is more dangerous than a silo. A hassle in the chain of command. Under a matrix, each team member has two heads to whom he is reporting. His direct functional manager and the project manager he is working with, sometimes if those are not aligning with each other, whether accidentally or on purpose, deadlines might overlap each other and this is where the poor team member gets lost. Should I commit to my function or department duties or the project manager deadlines? 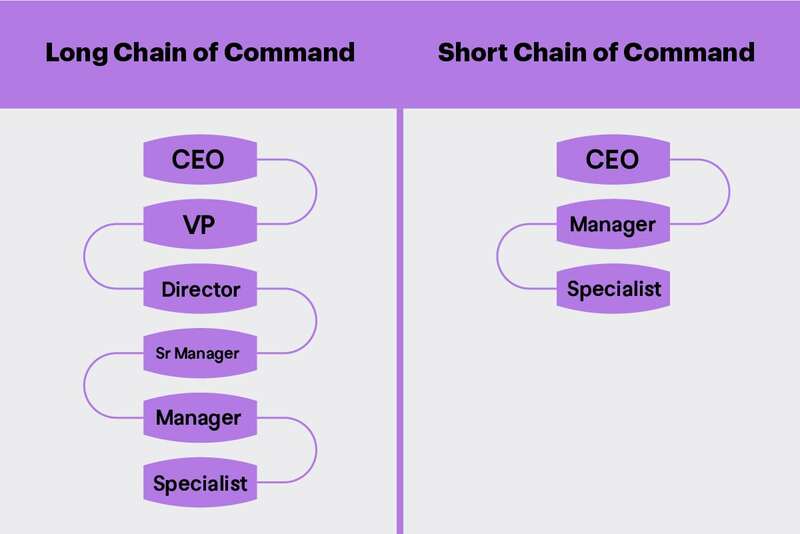 That's why when following this structure, your chain of command should be made clear to everyone, even if not written in a way that project manager X has an authority over function manager Y, it could be be just general agreed upon rules. "Deciding what to work on can be the hardest part of your job at Valve. This is because, as you’ve found out by now, you were not hired to fill a specific job description. You were hired to constantly be looking around for the most valuable work you could be doing." This is basically how valve put out their flat structure in the team manifesto. Under the flat structure, you will be with no management to tell you what to do, you have no job title or seniority level. Everyone is equal and the organization is being self-managed. All you're required to do is creating project teams and linking them together to work. This is usually hard to follow especially if you're already an existing organization. It will cause hassle and will take up a lot of time and effort to get people to adapt to the new structure, unless your company is small or still a startup. Under flat structure, the one appointed as the project lead is not actually there to lead the project and tell people what to do and what not to do. People with experience has a more of an organizing role and they have to bury their ego ensuring that everyone on the team is meeting their best possible productivity levels and blocks are removed out of the way as quick as possible. Removing layers and opening lines of communication. 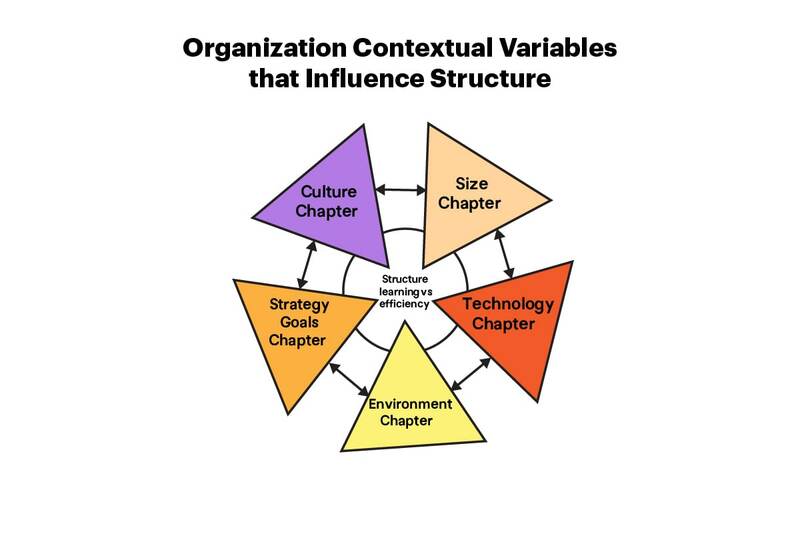 This his how you turn your organization into a flatter structure, the model is mostly used by mid-size and large organizations. Supporting it with the latest technology in communication to keep the team connected and all aware of what others are doing through team collaboration softwares like Trello or Basecamp so information can flow on any device, anytime and anywhere. This model is suitable too if you want to empower everyone inside your company, hence information will not flow from up - down, and instead will be shared across all the company. You can't have two structures in place because that's not possible technically and not what flatarchies mean anyway. But under a flatarchies structure, you can be following a hierarchy structure and have teams acting in a flat manner or you can follow a flat structure and have teams acting in a hierarchical manner. The company usually fosters one defined organizational structure. Then members of the team suggest ideas and projects that the company can work on, and as the company have a vision of fostering innovation, some of these ideas pass and turn into internal projects. This is when usually a team is created with a different structure supporting the end goal of the internal project or the program. This is how they create more autonomy and less bureaucracy. Flatarchies works best when you're working towards adopting a new technology or developing a new product or service and there is a need for creating a new team. It suits all types of organizations, from different sizes and industries. In 2001, Brian J.Robertson, quit his stable job to find a company called Ternary software that worked as an experiments lab for different models and methodologies like lean, agile, waterfall and other models. Through the different insights formed, he established HolocracyOne in 2007, and this is when the model began to be shared with the world. The idea is simply eliminating every boss inside the organization and replace it with an entrepreneur instead. Unlike other models, the goal of this structure is to allow for distributed decision making process and give everyone the opportunity to work on things they love the most. So solving Issues is not the responsibility of the leaders because everyone inside is a leader, and everyone is responsible of designing his role as the best way it fits. And although the structure might seem complex, random and consisting of lots of guidelines and components, at its core, it consists of only circles intersecting with one another. For example, we are talking about a company that consists of three main circles, Sales, Marketing and PR. Members of this company are free to choose to allocate their time among different activities they love to be part of in these circles. And although the system has been fought fiercely from different business leaders accusing it with forcing laws that are against the human nature, it's still proving efficiency. "This new environment isn't right for everyone, because some employees just want to know what steps one to 10 are and be told by a manager that they've done a good job when they finish. In this new self-managed world, employees sign up for a role or a circle, and each of those has a purpose associated with it that employees have to figure out how to make come alive. And so it gives them a lot of freedom, but I understand at the same time that amount of freedom can be super scary for some people". Also, meetings run inside the Holacracy system are run by a no discussion rule assures there are no time loss and decisions are made with regard to everyone opinion then a leader is assigned as a final responsible. The debt is still going about whether Holacracy is the new solution for structure hassle and you can keep on the news and get access to more resources by following their website. 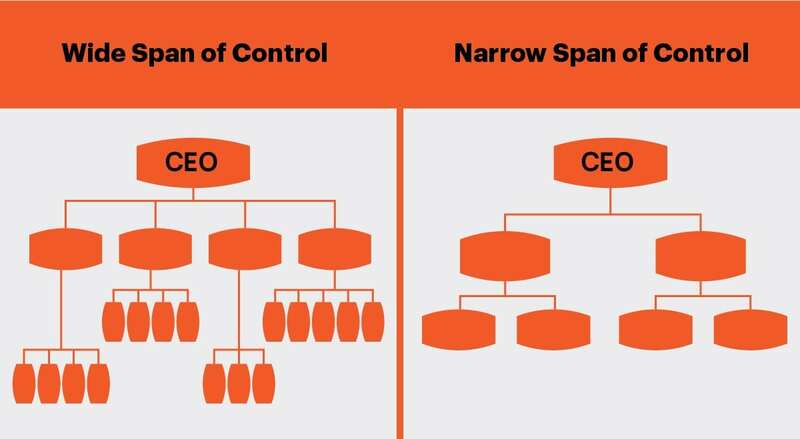 Organizational structure is not overwhelming as it might seem. A book like "Reinventing organizations" can give you a more in depth knowledge into the whole topic. But after that, it's really up to you to determine the type of organization you want, no book or guide or even a blog post can do that for you. However, there are some factors to consider when selecting the type of structure for your organization. Your organizational structure should support your business goals or otherwise it will work against it. So if you're aiming for stability and efficiency, you might need tight control and high degree of formalization, centralizing all the decision making process around you will give you the degree of control needed in this case. While if your goal is having more flexibility within the organization and fostering a culture of innovation, you might need to go more for a horizontal structure where there is face-to-face communication and everyone is a decision maker. In this case, you will have a loose control and a very low degree of formalization. As the environment of the business has a major effect on how it operates, it will surly affect the organizational structure in a way or another. For instance, a customer centric mentality requires establishing a separate team that can handle customer care and clients' requests. Also the political, economic, cultural and competitions control how organizations are formed to some degree. A startup structure is definitely different from an incorporation. And one mistake in the structure of an organization can make disasters to the budget and the costs allocated to teams. 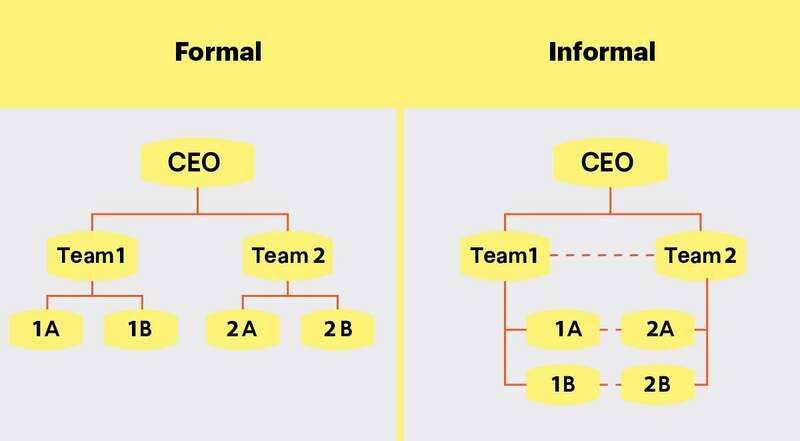 The size of the organization is not only the number of teams operating inside and outside, it refers to the volume of the inputs and outputs to and from the system. Also the assets of the organization and the physical capacity of the offices affects the structure of the teams. According to Joan Woodward experiment, the classifications of the technology in every industry is different and affects the number of labor needed and hours of production. That's why when planning for your organization structure, you need to take care of the level of technology in which you are operating in as it affects your employees productivity. According to the experiment conducted with over one hundred companies. 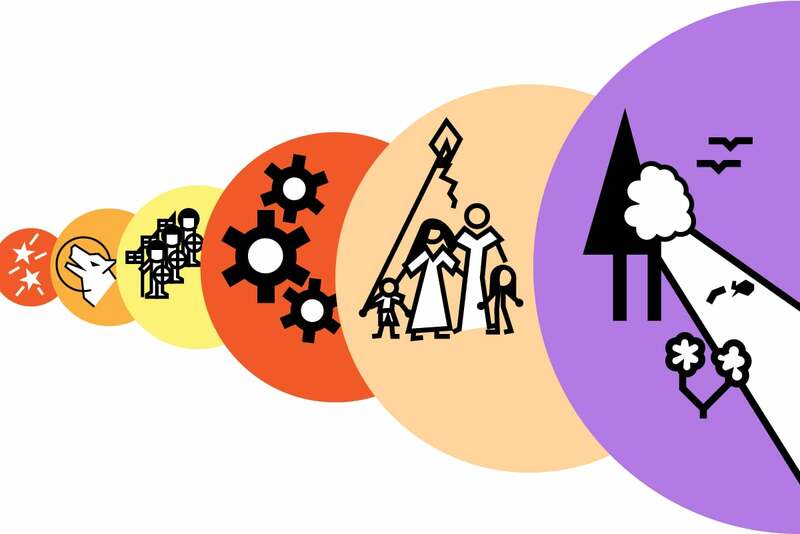 A culture of the organization is the set of values, behaviors, norms and assumptions that drive the people inside and impacts the production and the company external relations with the world. For instance, if your culture provides employees with freedom to allocate some of their working time for innovation and side projects, your organizational structure has to allow that by reducing the level of bureaucracy and supporting this with the regulations needed. Considering the mentioned elements is not the final step in creating a perfect organization structure, making a structure and keeping it in your mind is not what brought you all this way. 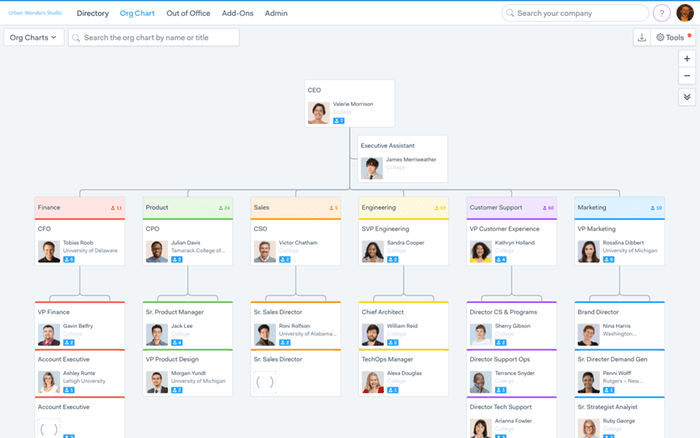 An organization chart must be created to visualize how the communication should be made between various teams, although some may rely upon tool diagram creating tools including the one in the Microsoft word, Pingboard offers a really compelling solution. First, you just need to have all the job titles and stuff names stored in your employees directory. Then, you can easily drag and drop to sort your team members based on the organization structure you selected, and to make it more compelling, it’s necessary to add the job descriptions and the roles expected from everyone. After that, you’re free to export to whatever format that suits your usage and keep it as a reference for the whole team.